to remain the same for life! No Rate Jumps. No Fine Print. Cleaning windows is our only business. We don't clean gutters or carpet and we don't mow lawns. 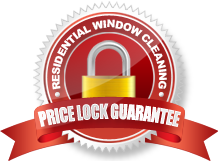 That's why when you call Just Windows Window Cleaning you get the best and most trusted window washing company in the St. Louis area. And this is no one-man operation either. The professional staff at Just Windows is fully trained and uniformed while our fleet of hybrid company vehicles fully identifies with the Just Windows trademarked logo, all for your protection. We carry full liability and workers comp insurance, which means you not only see better but you breath easier knowing professionals with the proper coverages are working at your home. Call us anytime for an on-site estimate. Best thing is, you don't even have to be home for us to complete the estimate! We will contact you with the proposal after we've checked out your property. You'll be seeing clearly and saving money in no time. Special occasion? We can get to you fast... No extra charge! CLEARLY, The Best Window Cleaning Option Since 1995! 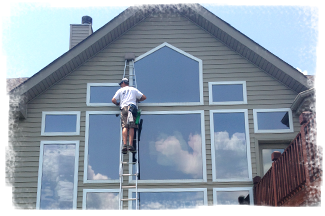 Just Windows Window Cleaning provides residential window washing services for the St. Louis Bi-state Area and surrounding communities including: Kirkwood, Sunset Hills, Oakland, Marlborough, Affton, Lemay, Webster Groves, Glendale, Rock Hill, Oakville, Mehlville, Green Park, Concord, Crestwood, Fenton, Byrnes Mill, House Springs, High Ridge, Arnold, Imperial, Barnhart, Des Peres, Manchester, Ballwin, Ellisville, Twin Oaks, Valley Park, Eureka, St. Charles, St. Peters, Shrewsbury, University City, Olivette, Ladue, Chesterfield, Creve Coeur, Clayton, Richmond Heights, Brentwood, Maplewood, Westport, Overland, Florissant throughout Saint Louis County, Jefferson County, Belleville, O’Fallon, Troy, Columbia, Waterloo, Milstadt, Swansea and Fairview Heights and beyond.